Start off your visit on the 11th (Thu): get a sense of history and politics at Independence Hall, then steep yourself in history at Elfreth's Alley, then admire the masterpieces at Philadelphia Museum of Art, and finally witness the site of a historic battle at Valley Forge National Historical Park. On the next day, take an in-depth tour of Eastern State Penitentiary, appreciate the history behind Liberty Bell Center, then take in the spiritual surroundings of Christ Church, then explore the world behind art at Barnes Foundation, and finally take in the spiritual surroundings of Cathedral Basilica of Saints Peter and Paul. To see reviews, ratings, photos, and more tourist information, refer to the Philadelphia road trip tool . The Route module can give you travel options from your home to Philadelphia. In July, plan for daily highs up to 88°F, and evening lows to 72°F. Finish your sightseeing early on the 12th (Fri) so you can travel to Albuquerque. Kick off your visit on the 13th (Sat): soar above the sights with a balloon tour and then take a stroll through Albuquerque Old Town. To see photos, traveler tips, and other tourist information, go to the Albuquerque itinerary planner. You can do a combination of train and flight from Philadelphia to Albuquerque in 7.5 hours. Alternatively, you can fly; or drive. The time zone difference when traveling from Philadelphia to Albuquerque is minus 2 hours. Traveling from Philadelphia in July, plan for slightly colder nights in Albuquerque, with lows around 67°F. Wrap up your sightseeing on the 13th (Sat) to allow time to drive to Durango. Take a break from the city and head to River Rafting & Tubing and Durango Fish Hatchery and Wildlife Museum. Visit Long House and St. Columba Catholic Church for their historical value. Explore the numerous day-trip ideas around Durango: Mesa Verde National Park (Balcony House & Cliff Palace). The adventure continues: browse the exhibits of Durango and Silverton Narrow Gauge Railroad and Museum, look for gifts at Earthen Vessel Gallery, get engrossed in the history at Animas Museum, and view the masterpieces at Scenic Aperture Gallery. To find photos, where to stay, ratings, and tourist information, use the Durango trip itinerary planning site . Traveling by car from Albuquerque to Durango takes 4 hours. Alternatively, you can fly; or do a combination of flight and shuttle. In July, Durango is slightly colder than Albuquerque - with highs of 86°F and lows of 54°F. Finish your sightseeing early on the 16th (Tue) so you can drive to Moab. Kick off your visit on the 17th (Wed): explore the striking landscape of Arches National Park. 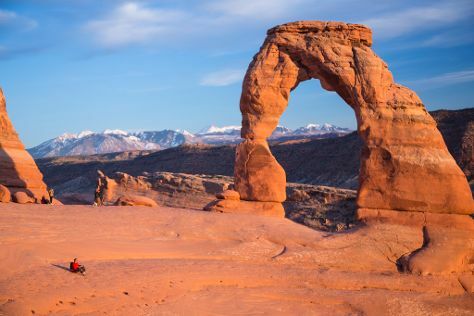 Plan trip to Moab with our itinerary maker to find out where to go and what to do. Traveling by car from Durango to Moab takes 3.5 hours. Alternatively, you can do a combination of bus and car. In July, Moab is somewhat warmer than Durango - with highs of 97°F and lows of 67°F. Finish your sightseeing early on the 17th (Wed) to allow enough time to travel to San Luis Obispo. San Luis Obispo, or SLO for short, is a city in the U.S. Kick off your visit on the 18th (Thu): explore the landscape on two wheels at Bob Jones City to Sea Bike Trail, get some thrills on the water with a speed boat tour, and then admire the architecture and history at Mission San Luis Obispo de Tolosa. To see reviews, more things to do, ratings, and tourist information, refer to the San Luis Obispo itinerary builder . Do a combination of car and flight from Moab to San Luis Obispo in 7.5 hours. Alternatively, you can fly; or drive. Due to the time zone difference, you'll gain 1 hour traveling from Moab to San Luis Obispo. Prepare for a bit cooler weather when traveling from Moab in July: high temperatures in San Luis Obispo hover around 80°F and lows are around 56°F. Finish your sightseeing early on the 18th (Thu) to allow enough time to travel to Los Angeles. Kick off your visit on the 19th (Fri): take a leisurely stroll along Santa Monica Pier, then examine the collection at The Getty Center, then appreciate the extensive heritage of Hollywood Walk of Fame, and finally see the sky in a new way at Griffith Observatory. Keep things going the next day: find something for the whole family at Universal Studios Hollywood. To find photos, where to stay, maps, and more tourist information, use the Los Angeles trip itinerary maker tool . Fly from San Luis Obispo to Los Angeles in 3.5 hours. Alternatively, you can drive; or take a train. Expect a bit warmer evenings in Los Angeles when traveling from San Luis Obispo in July, with lows around 66°F. Wrap up your sightseeing on the 20th (Sat) to allow time to travel to Las Vegas. 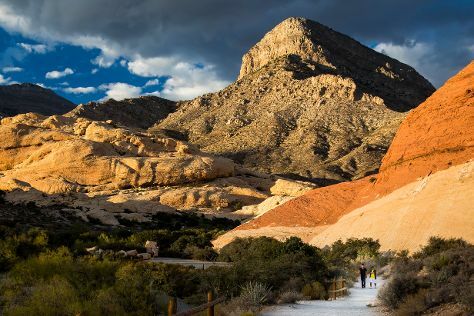 On the 21st (Sun), see the interesting displays at The Mob Museum and then take in breathtaking views at Red Rock Canyon National Conservation Area. On your second day here, admire the natural beauty at Bellagio Conservatory & Botanical Gardens, then shop like a local with The Strip, and then don't miss a visit to Bellagio Fountains. To find traveler tips, other places to visit, ratings, and tourist information, you can read our Las Vegas trip builder . Traveling by flight from Los Angeles to Las Vegas takes 4 hours. Alternatively, you can drive; or take a bus. While traveling from Los Angeles, expect warmer days and somewhat warmer nights in Las Vegas, ranging from highs of 104°F to lows of 81°F. Finish up your sightseeing early on the 22nd (Mon) so you can travel back home.